Finally finished this triangle quilt! I saw the original pattern in McCall’s Quilting. Unfortunately, I can’t seem to find the publication right now to give proper credit. 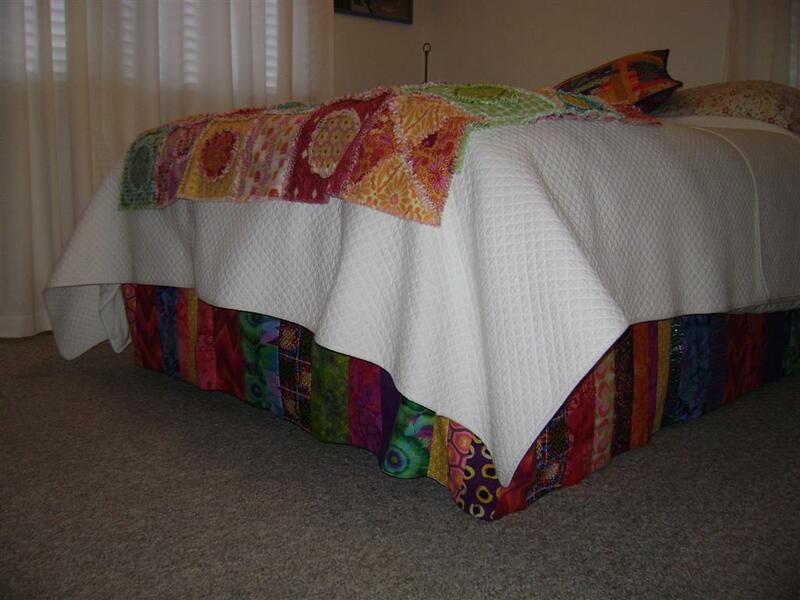 It was designed as a much larger quilt with a white background. I had a solid charm pack and wanted to add some pop with a print as the background color. The black and white did the trick! When finished, I just knew a regular binding wasn’t going to work, so I decided on prairie points. A quilting buddy suggested lined prairie points. Aren’t quilting buddies just so helpful? Thanks Cathy – they worked! I’m quite pleased with the final outcome, although, you really can’t stare at this one too long. This quilt NEEDS A NAME – can you help? Leave your suggestion in a comment. The name chosen will receive a fat quarter pack of Kathy Davis’ Enchantment. I’ll pick a winner in April (in celebration of my birthday). (open to USA addresses only). 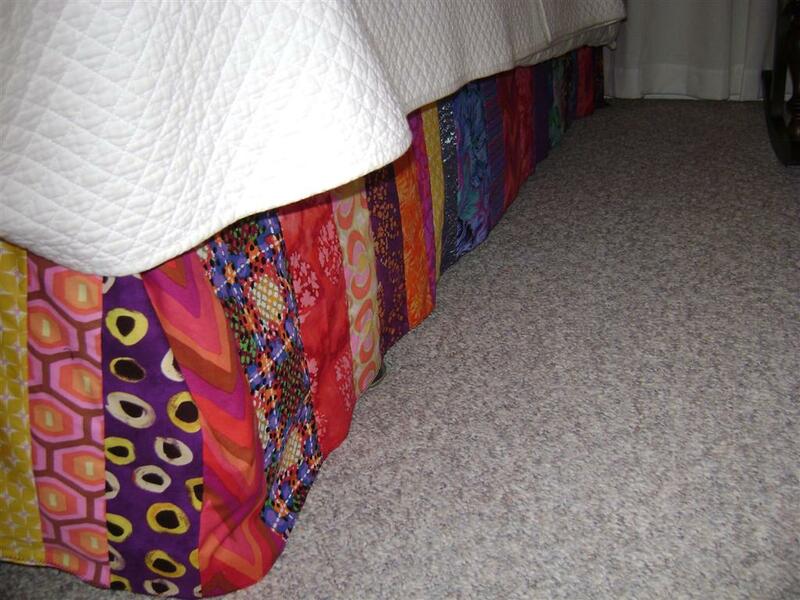 Bedskirt for the guest room – I cut strips of varying widths from very colorful and fun fabrics, sewed them together, attached them to an inexpensive bedskirt and Yeah! Color! I think it really works well with the white bedspread and the colorful flannel throw. This was a fun and quick project. Posted in Uncategorized and tagged Color, Give Away, Quilting. Bookmark the permalink. 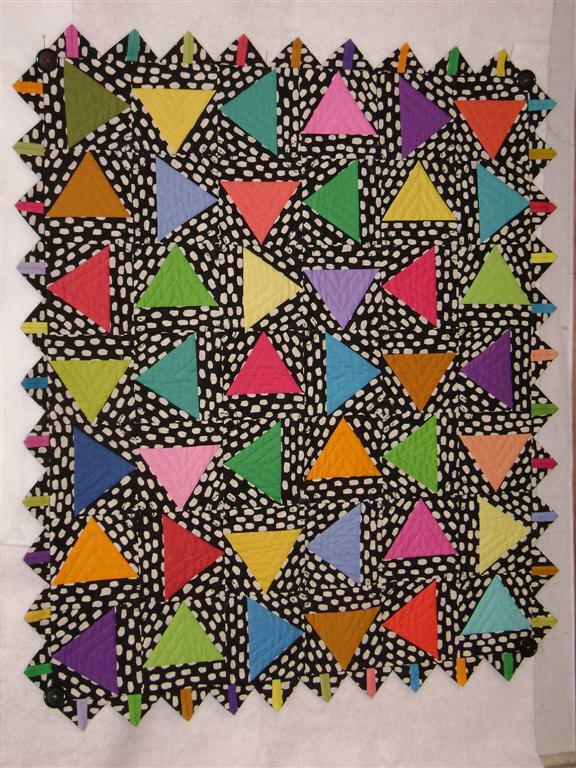 this looks like a “birthday party” quilt to me! I loved your quilt and would name it “Cha Cha Cha” or “Fiesta”.